In the 60’s, I grew up in Austin on the far West Side of Chicago. We had the State Theater on Madison Street a couple of blocks east of Austin, the border line that separated us from The Village of Oak Park. The Marlboro Theater was located two and a half miles east at 4110 W. Madison. It was twice the size of the State. The Marlboro opened in 1927 two years before The Depression and radio cut into film attendance as the main form of entertainment. It had a capacity of four thousand seats which was very difficult to fill even half way when television burst onto the scene in the late 1940’s. By 1963, there were probably more rodents in the building than people watching movies. Still, I recall that going to the Marlboro meant I was going to see a classy, first-run film. After a series of arrests made by the police due to gang activity on the premises, the theater closed for good and was torn down a year later in 1964. Between these two places was the Byrd Theater on the 4700 block of Madison, just east of the corner at Cicero. It was much smaller than the Marlboro but it became a safer alternative to go see a movie as the neighborhood east of it changed. Uncle Henry took me there to see two films- John Wayne’s Comancheros and a maudlin 1958 Disney film for kids called Old Yeller. Like all the other kids, I cried near the end at the appropriate moments. Uncle Henry as usual bought me pop corn and pop, sat next to me and proceeded to fall asleep. He always seemed, though, to know when the movie was over. Dad took me to see second-run movies at the Central Park Theater, on the 3500 block of Roosevelt Road. There was a double bill of Robert Taylor swashbuckler movies. One title I remember was Ivanhoe. Seeing a movie in vivid color in the the late 50’s or early 60’s was breathtaking as television at home was dull black and white. I would ask Dad to explain what was happening on screen but he ignored me. Another time, he took me to a double bill of Marx Brother movies- A Day at the Races and A Night at the Opera. It was the first time I was exposed to their humor and was in awe from then on. 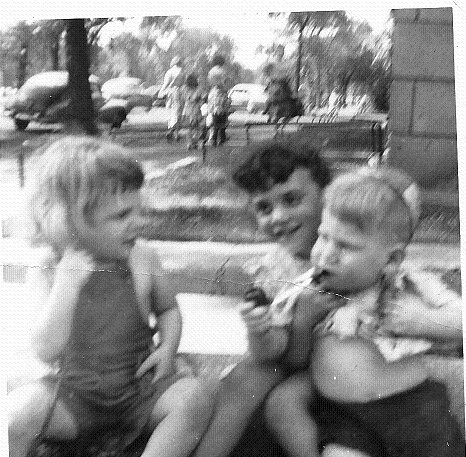 By the mid 1960’s I was old enough to go to the State Theater with friends unchaperoned. The Men’s washroom was on the second floor and required walking up a steep narrow winding stairway. Groups of greasers would hang out there hogging the space by the washing sinks in front of the mirror combing back their oily hair. I’m sure these guys are all bald now. One time I went with my older sister to see a flick called Experiment in Terror. We had no advance idea of what the movie was about other than it starred Glenn Ford. We figured it had to be a comedy, romance or western. It was, instead, a thriller. Once they took our money, I knew there was no way the manager was going to give it back to kids unaccompanied by an adult. We just hoped that the second half of the double feature was better. One time my buddy Perry and I showed a little moxie (or stupidity based on your perspective). We rode our bikes south to the Olympic Theater in suburban Cicero. It was a block west of Austin Boulevard on Cermak, That was a three mile ride in each direction all on busy streets. Imagine today leaving a bike chained to a light post in front of a storefront today for a few hours. But they were there when we came back out. In high school, I took a course in American Government and Politics (as if the two didn’t go hand in hand?). One time, our teacher announced that she was looking for volunteers to attend downtown in the Loop a series of Council on Foreign Relations meetings. The sessions were by invitation and students were encouraged to witness the political harangues. I was the only student to raise a hand so I went. The first meeting was held in the Palmer House Hotel in the Chicago Loop. It was over around 2pm and I figured that I could not get back to the far north side and school until at least 3pm. So, why bother to go back? After all, I deserved a reward for taking good notes to present later in class. I walked down State Street going north past Washington and noticed the movies listed on two Marquees. On the east side of the street was the Chicago Theater showing a movie called Butch Cassidy and The Sundance Kid. It starred Paul Newman and somebody named Robert Redford. I couldn’t imagine good old Paul as a cowboy even though he had played a left handed Billy The Kid earlier in his film career. On the west side of the street, where I was strolling, was The Undefeated at the State Lake with John Wayne and Rock Hudson. Naturally, I chose the more manly western and got back to school for the last class which started about 4:45pm. Not long after, the Newman picture went on to become a cult classic and Redford becomes ensconced as a bona fide star. The John Wayne was another in a series of turkeys late in his career before “True Grit”. I pick baseball pennant winners much better than I do Oscar worthy films. It’s a cinch. Every year, I go with the Cubs.